The best thing about indoor growing is the level of control you have over your growing environment. 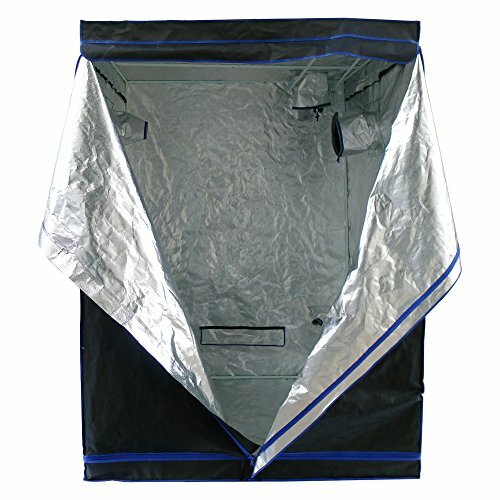 But truth be told, without a high-quality grow tent, you have little to no control over the environment. 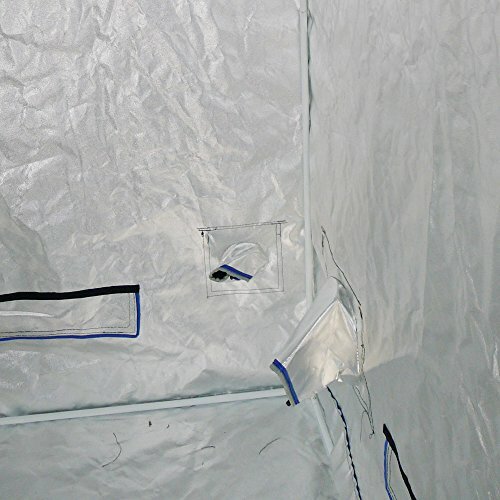 While a grow tent is just one of the vital components of a good indoor grow operation, it can be the dealmaker or the deal breaker. 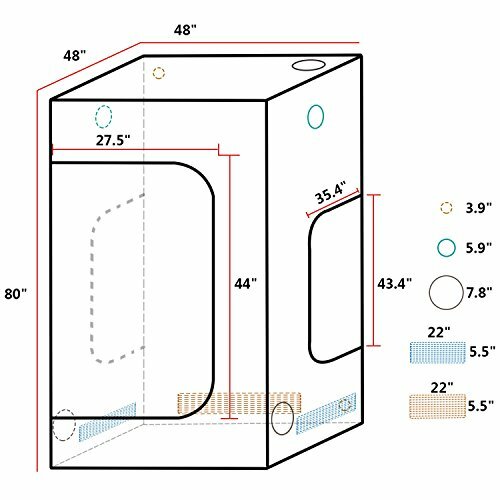 So, how do you determine whether a grow tent is good or bad for you? First, it must be big enough to accommodate the number of plants you want to grow. It must also be compact enough to fit in the allotted space. 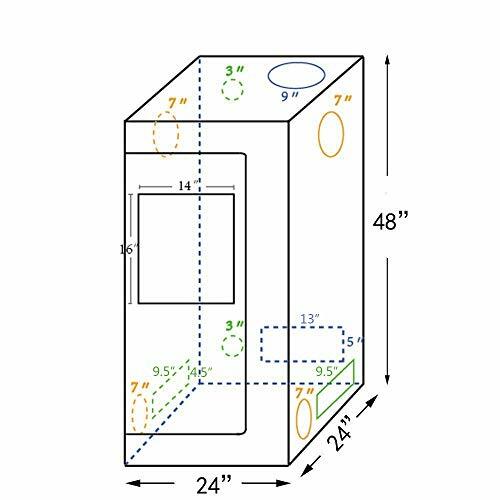 Secondly, the grow tent must be tall enough to accommodate your plants at their peak height and leave enough room overhead. 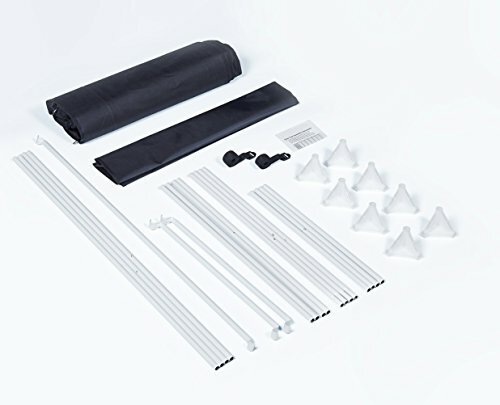 Some grow tents come with extension kits or flexible poles you can adjust to your preferred level. 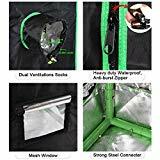 A good grow tent also has ventilation and exhaust ports. 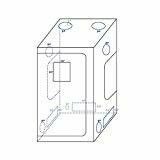 Ventilation ports usually have flaps that can be lifted to get rid of hot air. Too much heat can damage plants and affect their growth. Exhaust ports are heavy-duty and can remove both heat and moisture. A lot of moisture leads to mold and mildew issues. 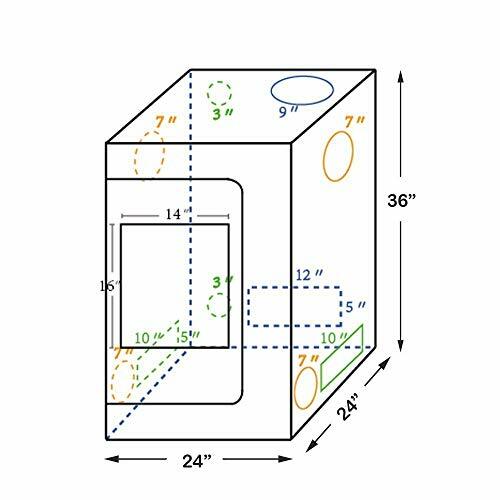 You should also look at the additional features when buying a grow tent. For instance, some tents come with sturdy bars where you can hang dangling plants. 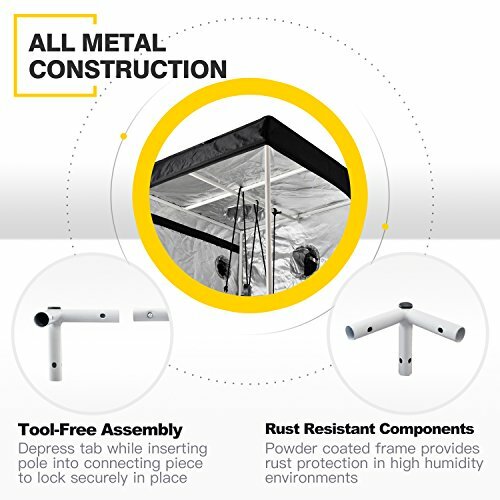 Other features to look for include a flood tray (which holds spilled liquids), a viewing window (that allows you to monitor your plants without disturbing the growing environment), a tool pocket (for holding tools), and a trellis net (for plants that need lots of support). 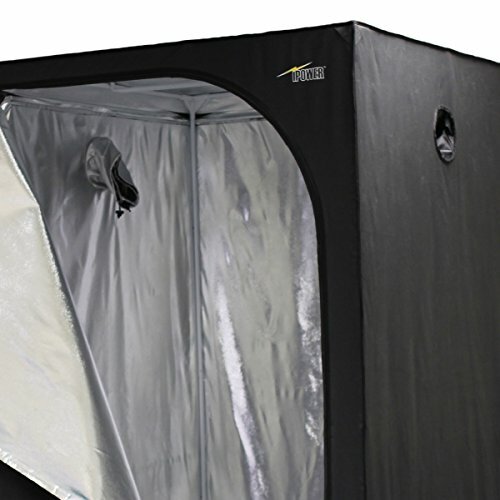 Today, we look at 28 grow tents that are ideal for different grow operations. 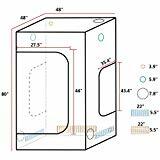 If you want to grow 2-4 plants, a 2×2 grow tent is ideal. 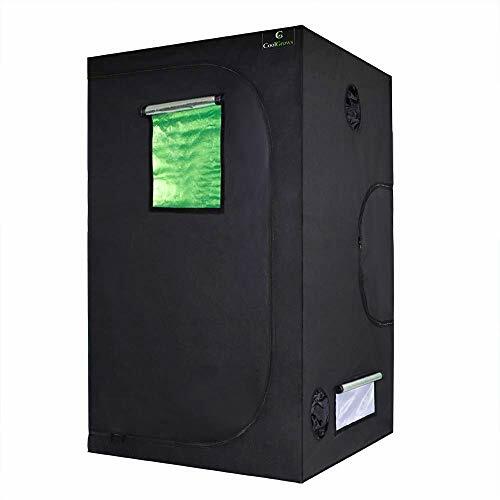 It is perfect for newbies to indoor growing, those who lack space, and those who want to be discreet. 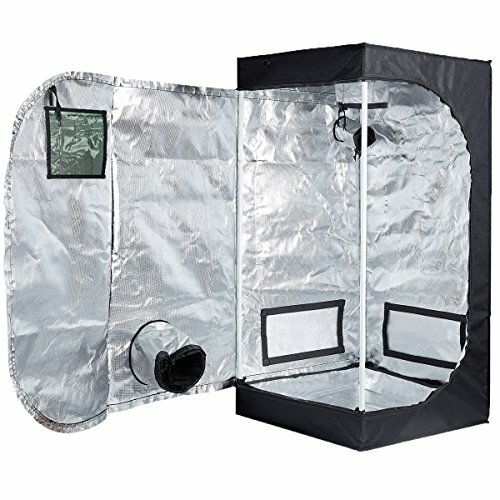 For the best results, pair a 2×2 grow tent with the Mars Hydro ECO 49 Full Spectrum Light or the Advanced LED 100W Grow Light. 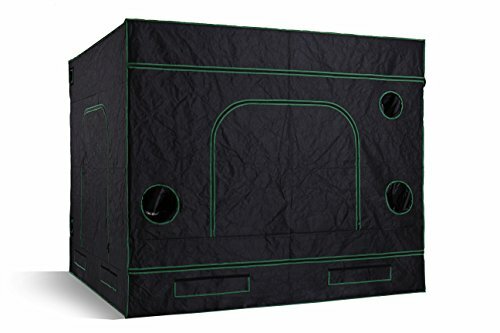 This durable tent gives you total control over the growing environment. 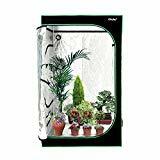 To create a conducive environment for plants to grow and ensure light is reflected back to plants, its interior has 99% reflective mylar lining and its exterior is made out of high-quality 600D oxford fabric. 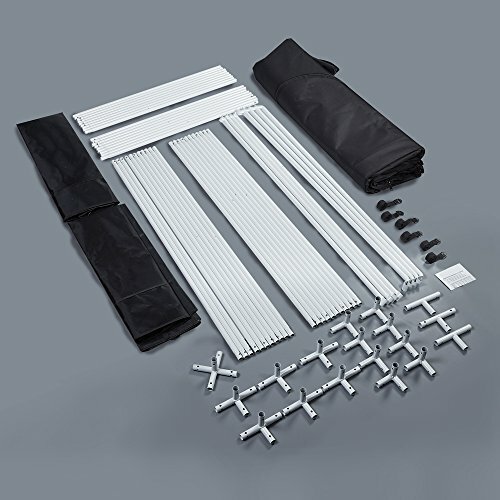 Metal bars and connectors make the tent stand solidly wherever it is placed. 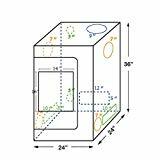 The viewing window is a valuable addition as it filters out white light and also allows you to monitor your plants. 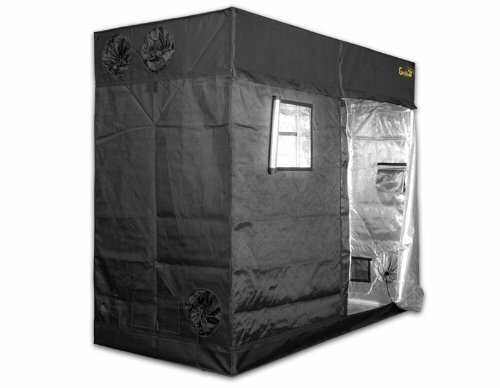 We love this grow tent because of its wonderful price point and many positive ratings online. 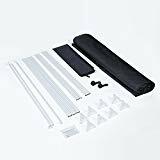 It is made using eco-friendly PEVA (polyethylene vinyl acetate) which is a safer alternative to PVC as it is free of chloride. 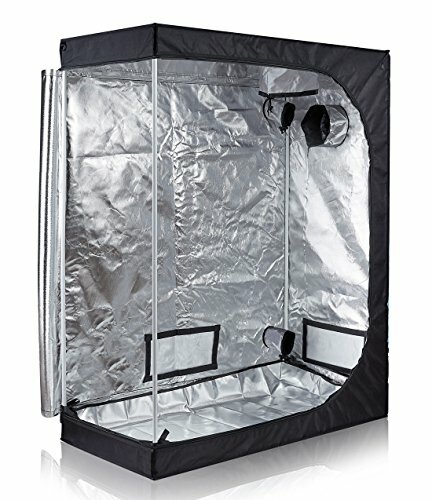 Its interior has a reflective Mylar lining that enhances the efficiency of any grow light. 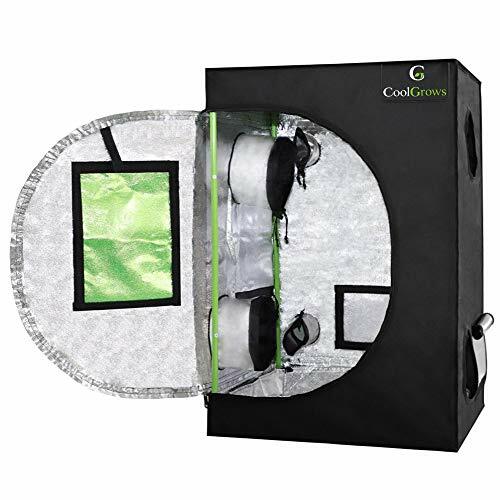 The CoolGrows grow tent is perfect for growing healthy plants easily and safely, from seedling stage to maturity. Its 600D thick material is fortified by metal poles for safety and stability. 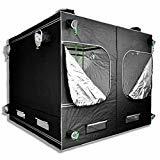 This is one of the most environmentally-friendly grow tents on this list as it has passed SGS testing and certification. It is highly efficient and has zero light leakage. 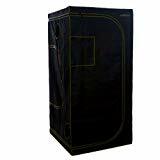 The grow tent is non-toxic and does not discharge any harmful gases, so you can grow your plants stress-free. 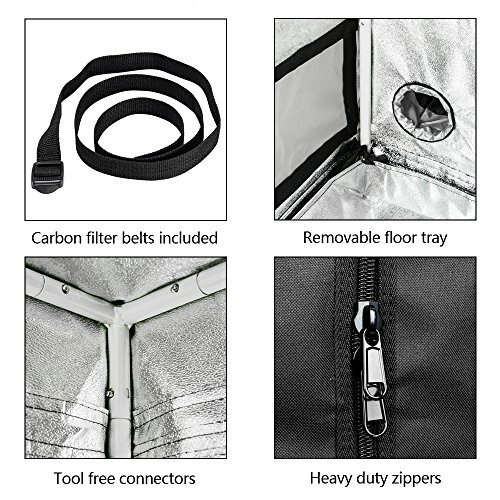 Its interior is exclusively made of reflective silver PET fabric and prevents any light from escaping. Its exterior is made of tear-proof and waterproof 600D oxford cloth. 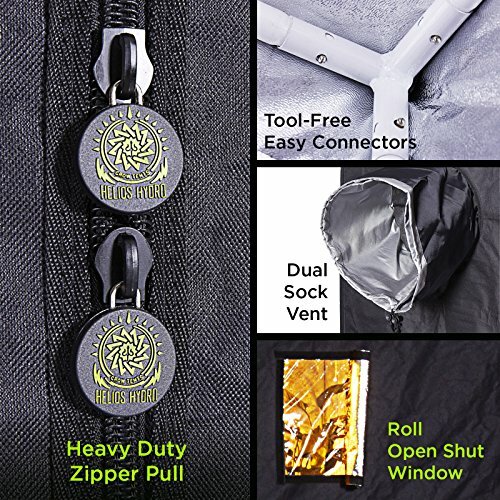 You’ll also love the anti-burst metal zipper. 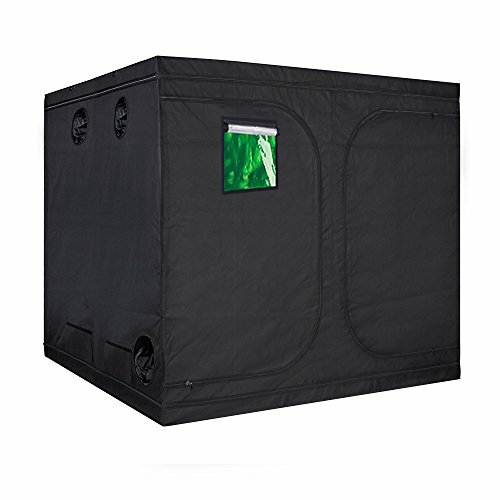 If you're growing a couple of tall plants, this grow tent is perfect for you. It is very compact and can even fit in your bedroom, putting your plants close by. The best thing about it is that it is very easy to put together. 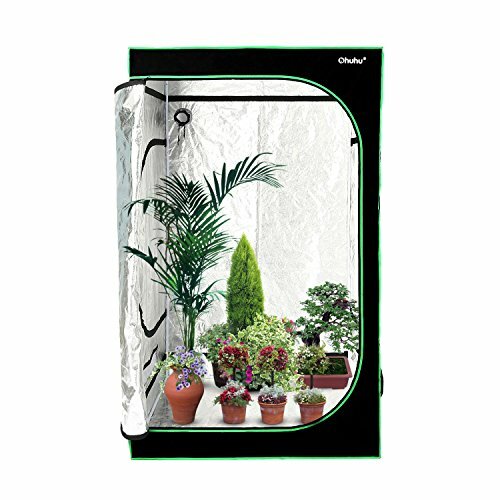 It has a small viewing window that filters out white light to maintain a perfect growing environment for your plants. Its 96% diamond mylar reflects light more. To boost ventilation, its rectangular vents are fitted with mesh. 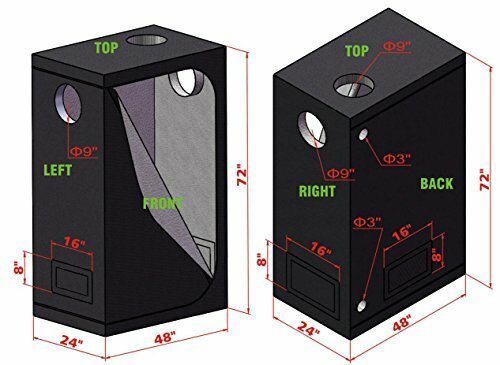 There are also additional vents for fans and filters. 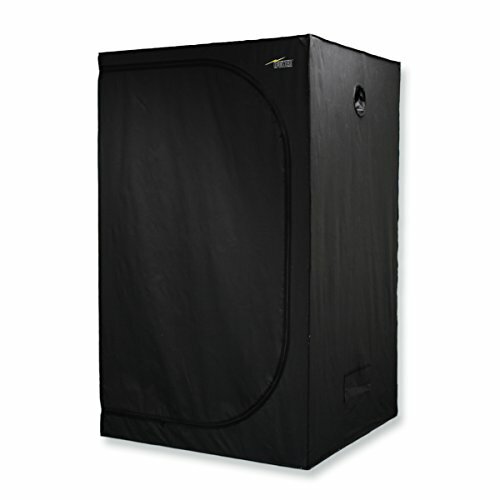 Perfect for 4-9 plants, a 3×3 grow tent is compact enough to fit in a small space. 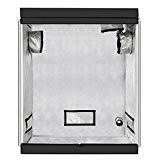 If you get this grow tent, you will need a light that produces 225 actual watts, like the Advanced Platinum Series P450 450W by Platinum LED or the BESTVA Reflector Series 1200W Grow Light. 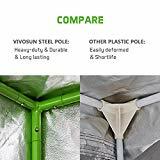 When it comes to indoor growing tents, VIVOSUN is one of the most reputable brands. 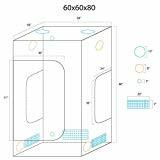 Its 3x3 grow tent is of very high quality. It has an exterior made of sturdy 600D canvas which is tear-proof and extra thick and will serve you for many years. 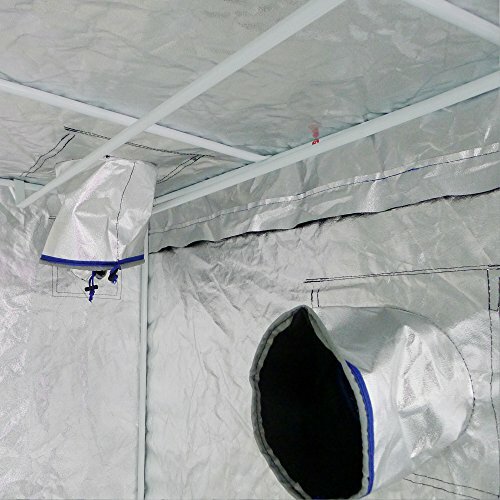 Its interior is lined with 98% reflective mylar to increase the efficiency of any grow light. 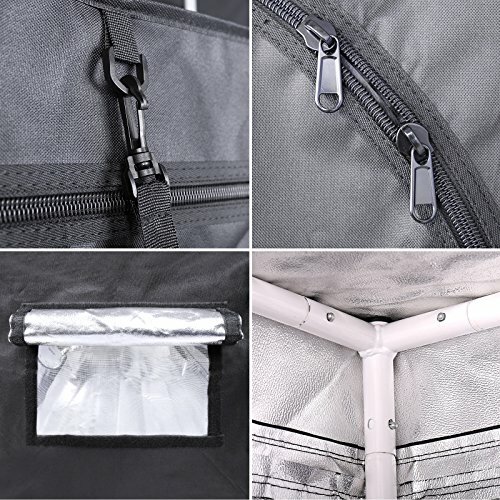 The tent features a heavy-duty metal zipper that will withstand frequent use. Its door is very easy to open and close. 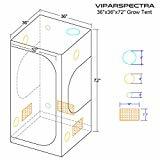 VIPARSPECTRA is known for its full spectrum LED grow lights that are loved by indoor growers. 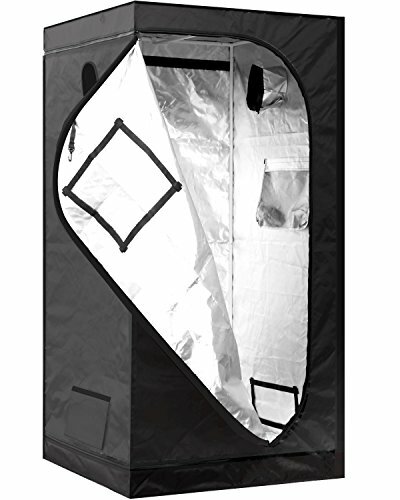 But the company also makes heavy-duty grow tents that are easy to put together – like this one. It features a durable 600D oxford fabric on the outside and 100% reflective mylar lining on the inside that is tear-proof and waterproof. The heavy-duty zippers and double stitching offer light protection and ensure no light is lost. The tent doesn't need any tool to assemble. 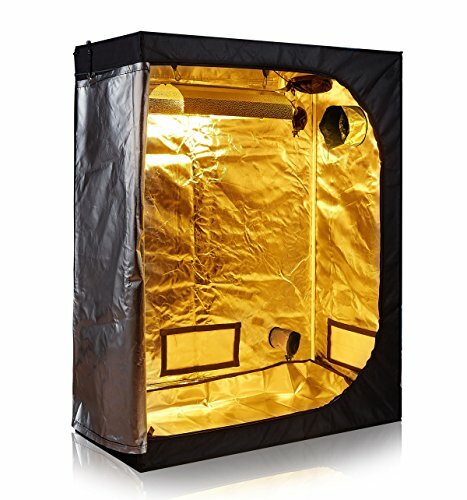 This is one of the bestselling grow tents online and shines in a few areas. 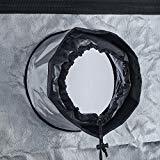 It is made with tear-proof thick tent material on the outside and has a 95% reflective mylar interior. Its duct ports cinch for a tight fit. 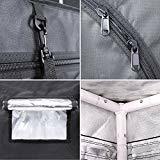 Sturdy zippers and double stitching make sure no light leaks out and metal poles make the tent very stable. 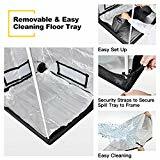 The removable floor tray makes it easy for you to clean the tent. 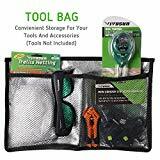 The tent also comes with a tool bag where you can store small tools. 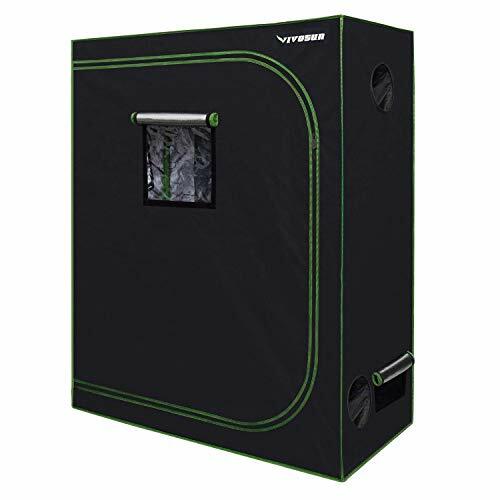 With a sturdy metal frame and Oxford 600D material, the MILLIARD hydroponic grow tent is one of the best on the market. Its many intake and exhaust ports give you full control over the humidity and temperature. 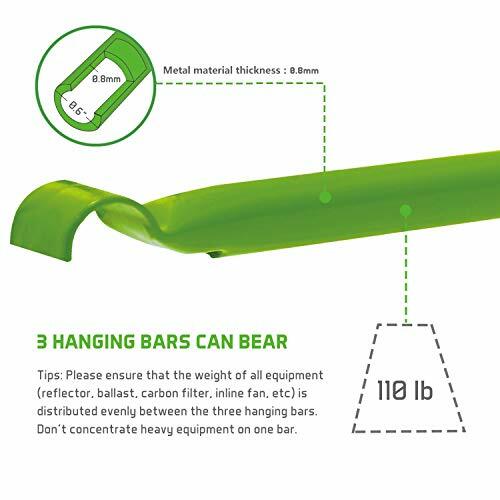 Its frame is durable and consists of 3 support bars and 4 metal rings for securing grow lights and other grow tent equipment. 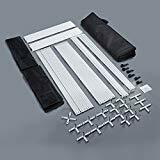 Metal push-lock corners make it easy to assemble the tent without any tools. 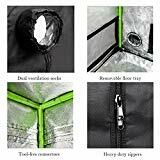 Tough, reinforced zippers make opening and closing the tent easy. 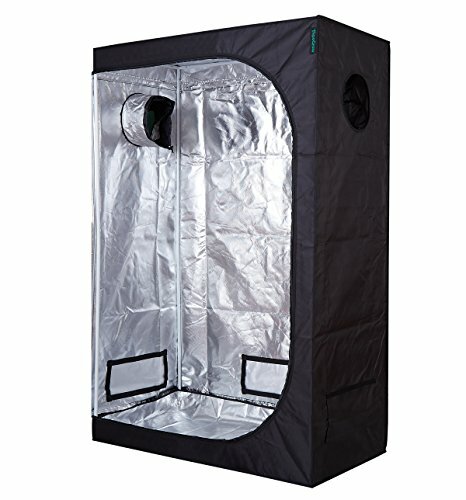 If you want a grow tent that can hold 4-8 plants, this is it. 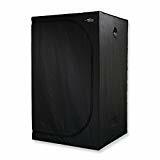 It can fit in a closet, an attic, and any other small space. 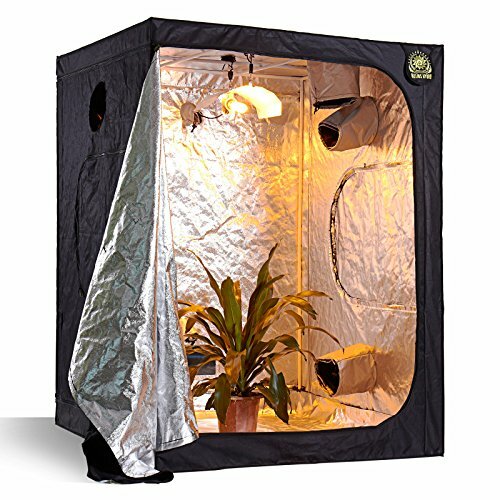 Since each plant you grow inside the tent needs 25 watts of electricity, we recommend you get one of these two lights: the HIGROW 1000-Watt Double Chips LED Light or the EX-VEG 300 by Advanced LED Lights. Some of the things that make this grow tent stand out are its 600D canvas fabric, reflective Mylar material (which blocks light from escaping) on the inside, and its 2-year warranty. The mylar lining reflects all of the light inside the tent and boosts the effectiveness of your lighting setup. This tent is very well constructed and has a durable frame that comprises metal bars and connectors. 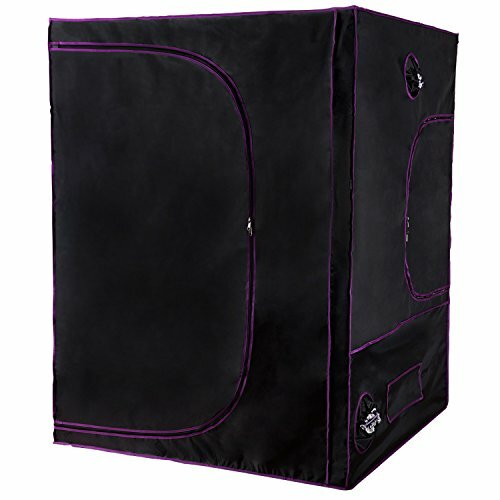 Its zipper is one of the best on the market and allows you to open and close the door smoothly. TopoGrow makes indoor growing equipment such as grow tents, grow lights, inline fans, and other accessories. 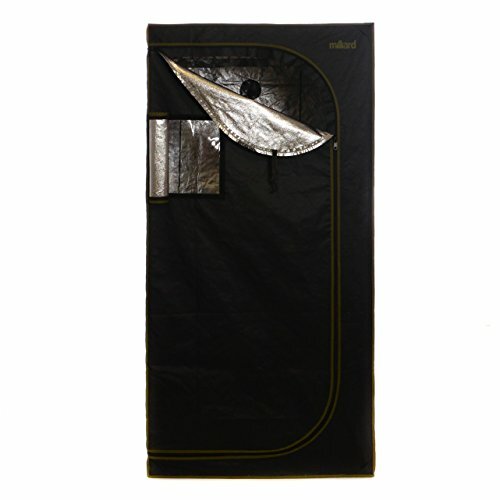 This particular tent is ideal for different types of plants: fruits, herbs, vegetables, and flowers. 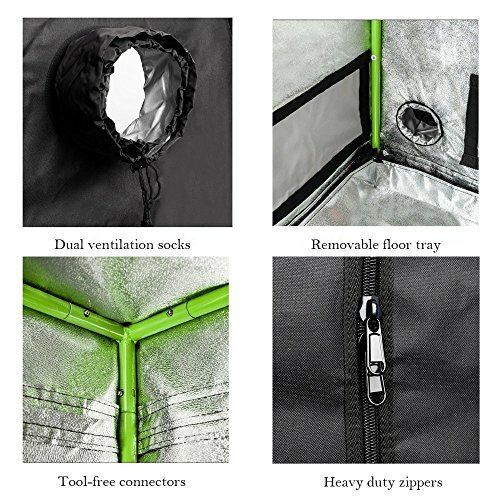 600D heavy-duty oxford cloth makes up the tent’s exterior. The fabric is lined with 96% waterproof diamond mylar that is more reflective than any other type of Mylar. 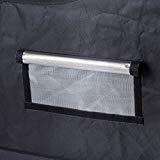 The tent also has strong metal zippers and double stitched seams for light protection. Several round vents with mesh help with ventilation. 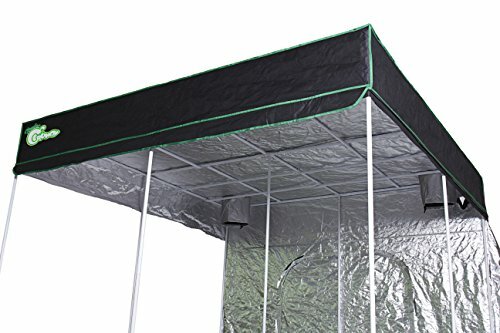 Ideal for 4-6 plants, this tent stands solidly thanks to its strong metal bars and metal connectors. Its viewing window makes it easy for you to observe your plants and its door unzips smoothly. 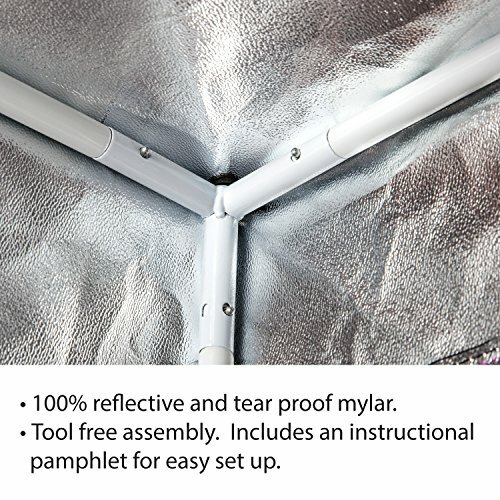 On the inside, a 99% reflective mylar lining ensures efficient usage of your lighting system. 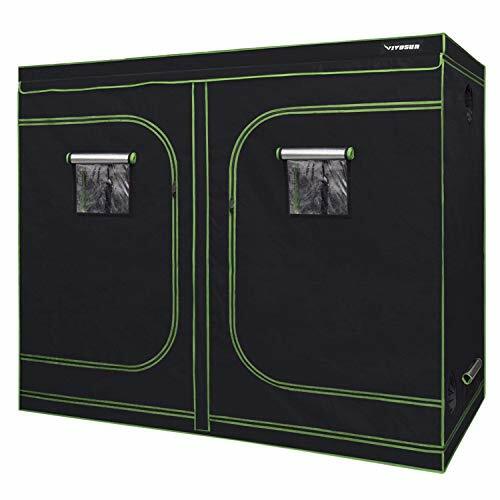 The tent’s door unzips smoothly and the observation window gives you freedom to monitor your plants whenever you want. 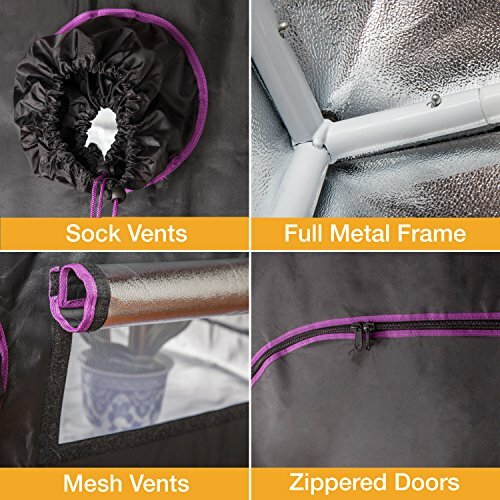 Privacy flaps that cover the zippers make the tent seem more like a wardrobe closet than a tent. 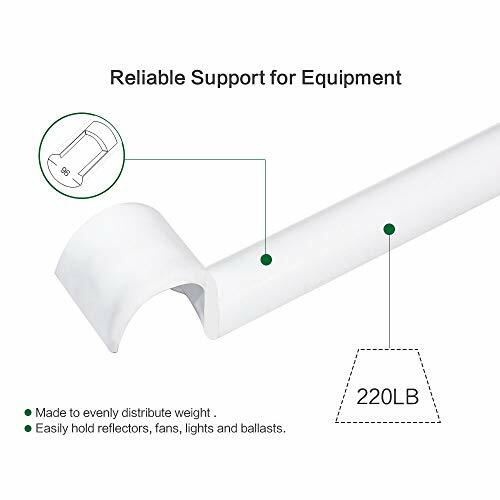 The best thing about the TopoLite tent is it guarantees almost 100% light protection to ensure the LED grow light used is as efficient as possible. The tent is built with durable 600D oxford cloth that is both light-proof and tear-proof. Its interior is lined with 96% diamond mylar which is the most reflective form of Mylar. Rectangular vents with mesh ensure the tent is always well ventilated and there are a couple of vents for fans and filters. 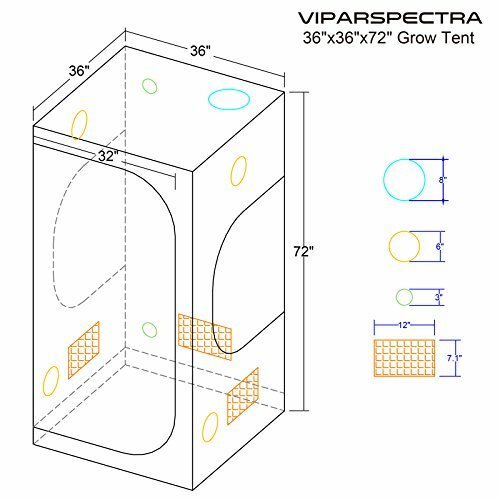 These are the most popular tents because they offer the perfect amount of space for growing 8 to 16 plants. 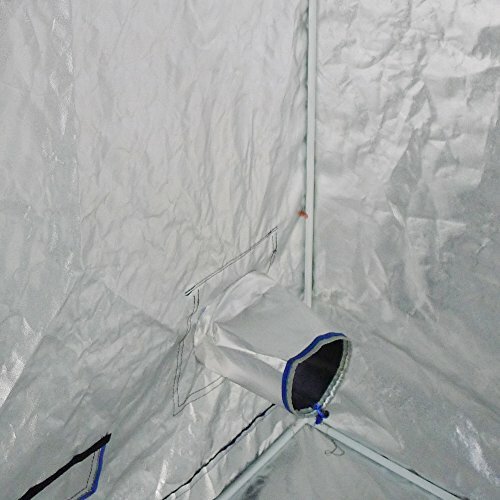 You need a full spectrum light that emits 400 watts for a 4×4 tent. 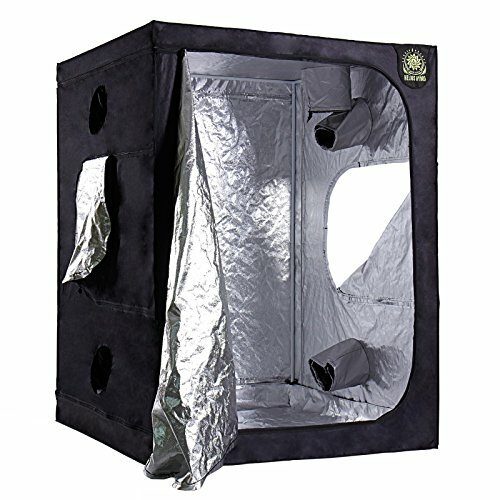 Get the VIPARSPECTRA Reflector-Series 900W Light or the California Lightworks Solar System 550 Grow Light. 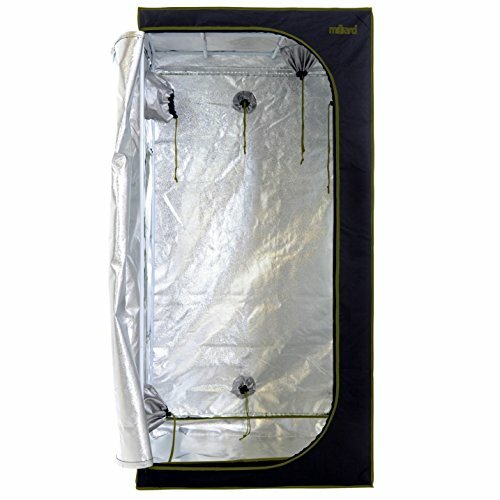 VIVOSUN makes awesome grow tents, period. 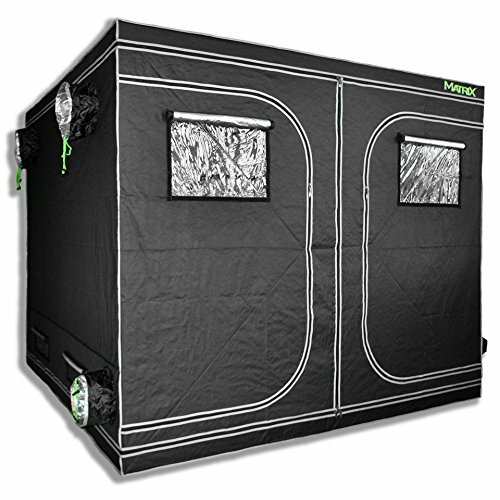 We like this 4x4 tent because it's small enough to fit in a closet yet large enough to hold 16 plants at a time. Its metal rods are strong enough to support large light panels. 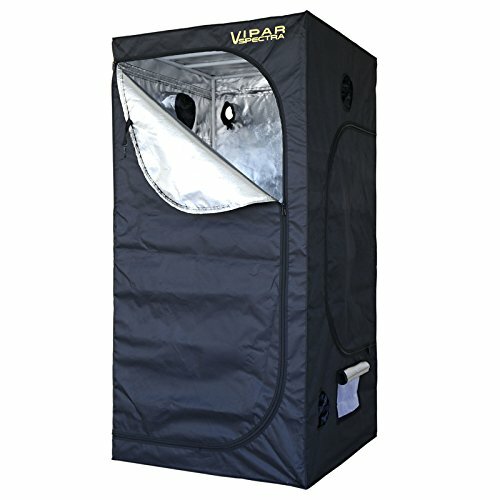 High-quality fabrics, a heavy-duty zipper, a viewing window, and a 2-year warranty make this tent very popular with indoor growers. 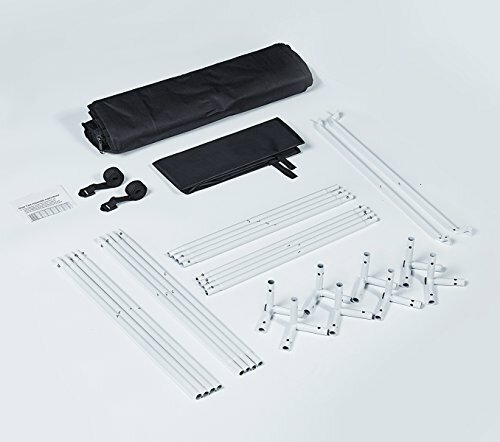 No tools are needed to assemble it, so you won’t have a hard time putting it together. 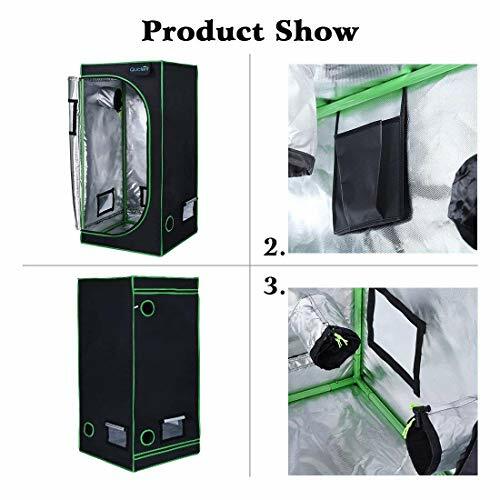 While you may love this grow tent because of its affordability and large size, it has other awesome features. 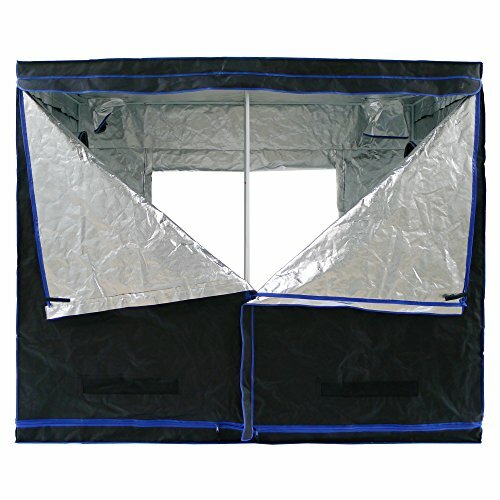 Its ventilation ports ensure it is very well ventilated and doesn’t retain heat and moisture. We also love its light-blocking features like the 98% reflective mylar lining, heavy-duty metal zippers, and double stitching. They allow your plants to make the most of the light and grow healthy and strong. 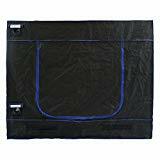 The extra thick canvas used on the exterior gives the tent durability and the metal frame gives it stability. While this grow tent is made using superior fabrics like the others we have reviewed here (99% reflective Mylar lining and tear-proof 600D oxford cloth), it has some features the other grow lights do not. Each one of its zippers has a privacy flap to give it a discreet look. 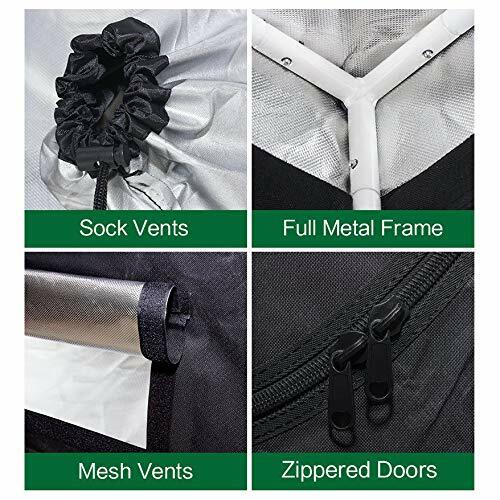 We love the fact that its thick fabric prevents odors from getting out and blocks pests from getting in. 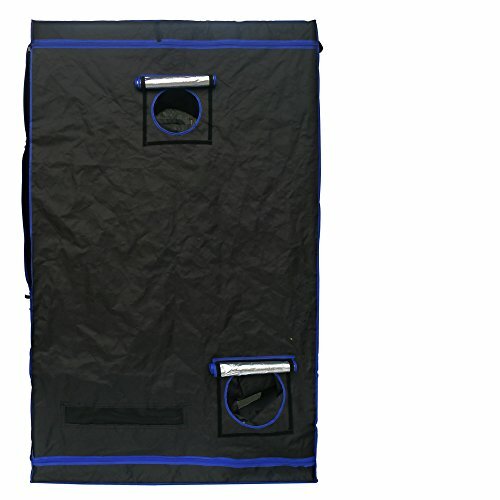 Its removable and water-resistant spill tray ensures that no water leaks to the bottom of the tent. 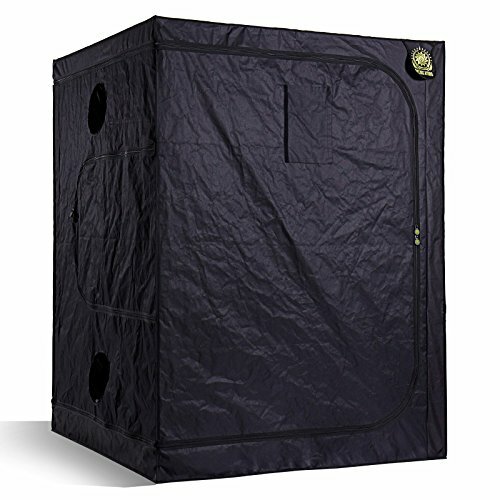 You'll find it easy to keep this grow tent clean because of its waterproof material. 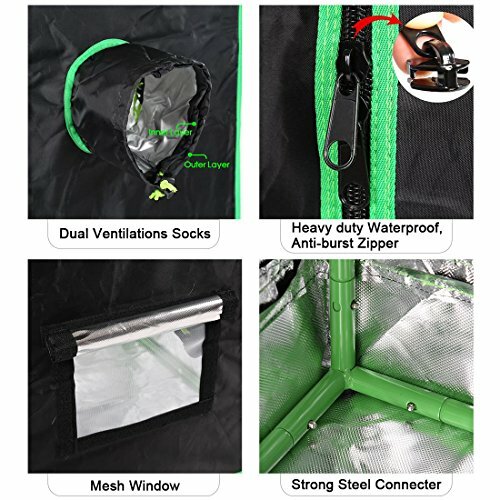 It is made with heavy-duty fabrics and is 100% light-proof. 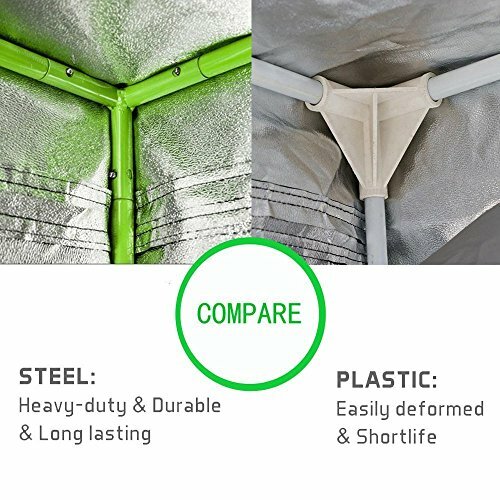 The frame is made of steel poles which give the tent stability. Each of the ventilation panels has a zippered flap with an industrial zipper. 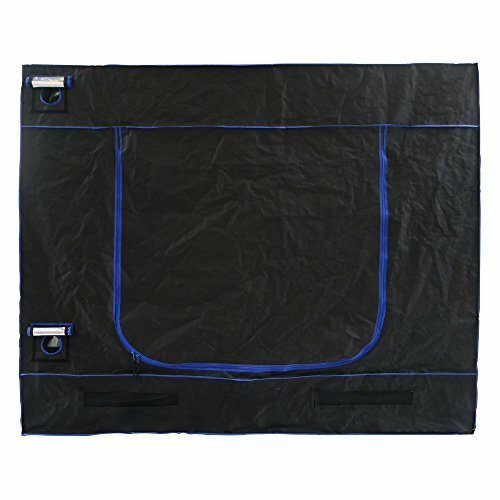 The removable floor tray comes in very handy because it makes keeping the tent clean a lot easier. 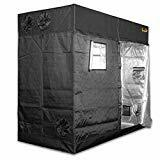 Some of the things you can grow in this tent include fruits, herbs, and vegetables. If you have some space to spare in your home, you can get a 5 x 5 tent and put it in the basement or the attic. 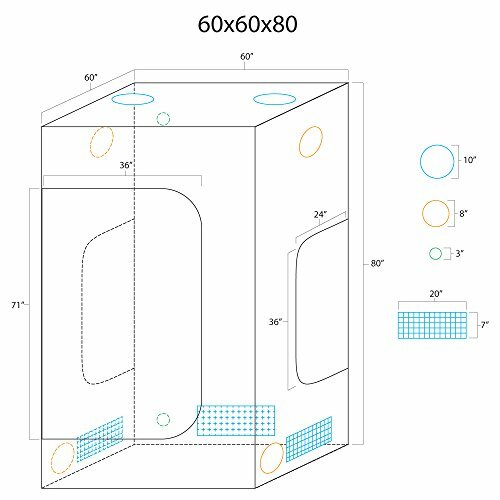 You’ll be able to grow 12-25 plants in it. 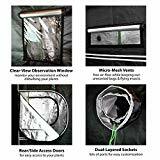 There are two lights we recommend for these tents: the California Lightworks SolarStorm 880W Grow Light and the Kind K5 XL1000 Grow Light. 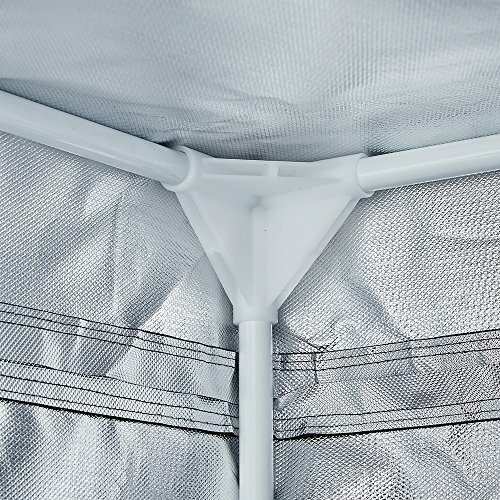 Apollo may be known for its entry-level grow lights, but it also makes durable tents. We love this one in particular because of the space it offers your plants. 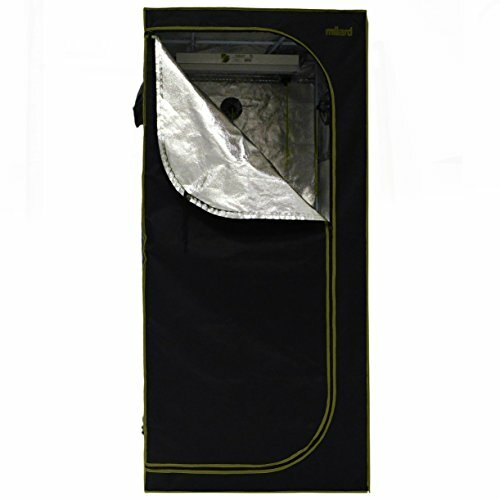 Its heavy-duty metal zippers protect your plants and also ensure they are easy to access. 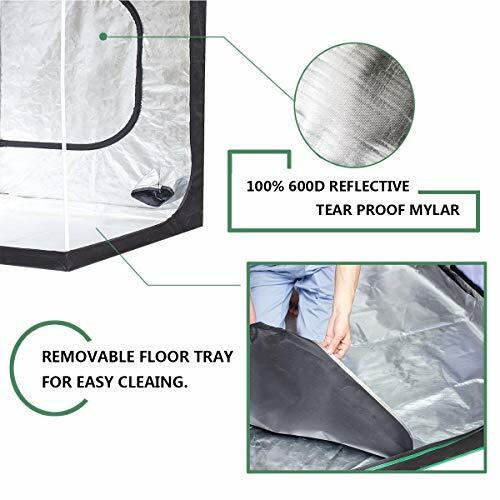 100% tear-proof and light-proof reflective mylar film lines the interior of the tent, reflecting up to 97% of the light back to the plants. 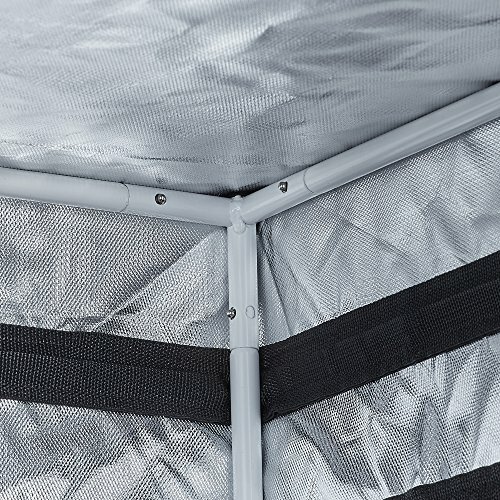 The metal poles that make up the frame keep the tent stable and secure. 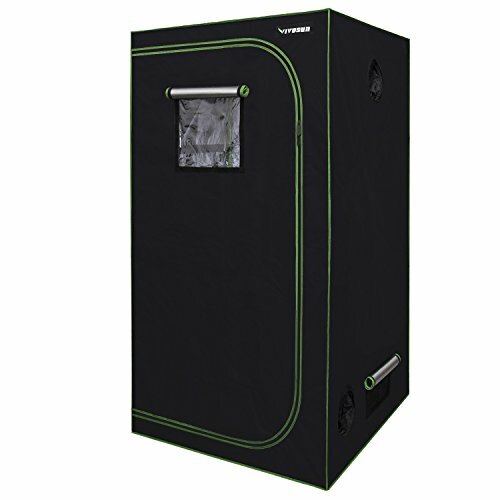 Backed by a 2-year warranty, we know the manufacturer took time to create this grow tent. It has a washable material and comes in blue and black colors. 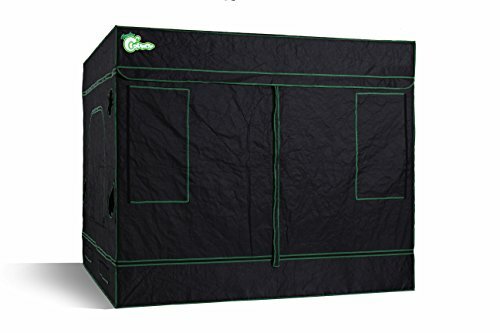 The tent is very spacious and can accommodate many grow trays and plants. Its interior is made of reflective mylar which ensures every plant receives sufficient light. 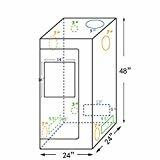 Its door is very large and gives you easy access to your plants. 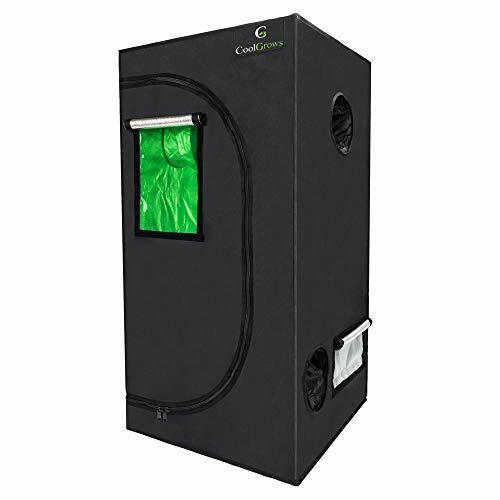 It also makes setting up your grow operation easy as you have enough room to move and set up lights, fans, and any other equipment. 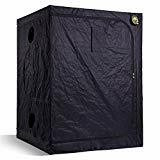 Some of the things we love about this grow tent are its thick tent material that is supported by metal poles, its water-resistant floor tray, and its 1-year warranty. Its heavy-duty zippers and double stitching guarantee zero light loss and its mylar lining returns the light back to the plants to ensure they grow as they should. 600D thick tent material gives it a long lifespan and also blocks odors from getting out and pests from getting in. 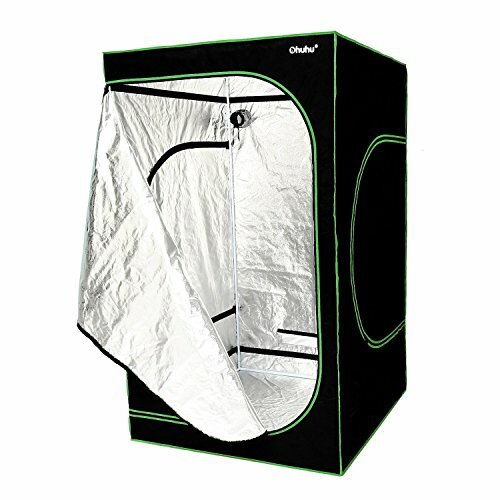 A perfect unit for any grower, the Helios grow tent has one of the best frames in the industry. 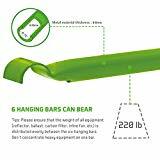 It features tear-proof 600D nylon and has a long lifespan. 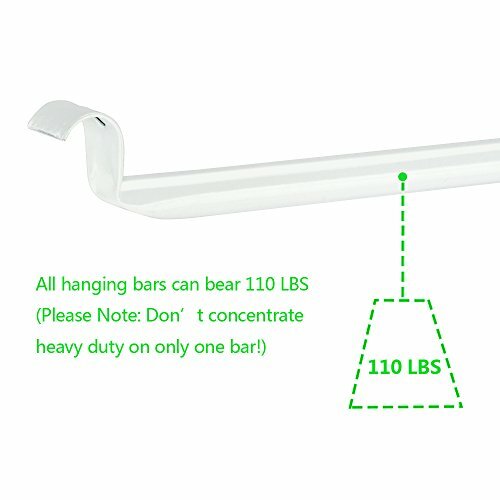 Its powder coated metal poles give it rock-solid stability and it has two crossbars for hanging lights or fans. 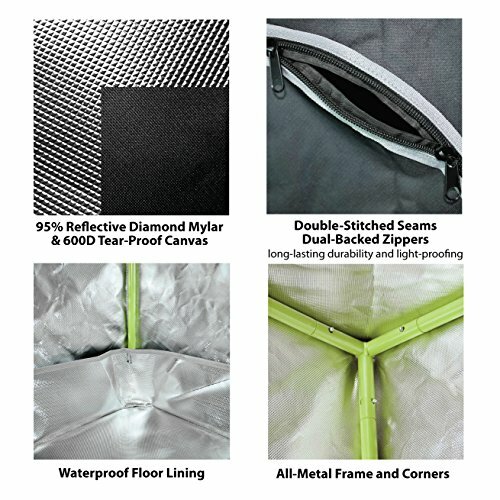 The tent is double stitched throughout and backed with high-quality reflective mylar film on the inside. The 100% light-proof lining returns almost all light back to the plants, enhancing their growth without extra energy consumption. 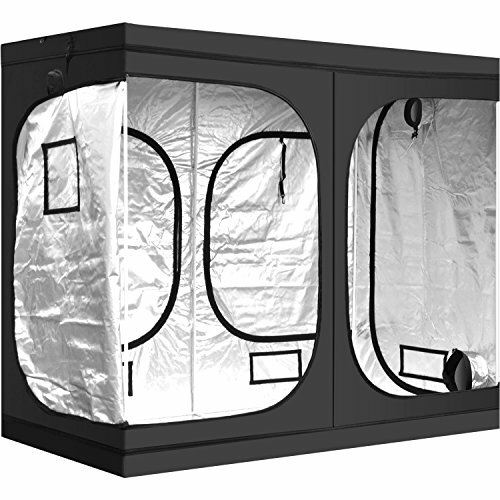 These tents are updated versions of 4×4 grow tents and have enough space for 16-32 plants. 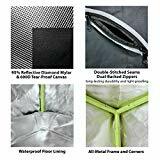 If you feel a 4×4 tent is too small for your needs, get a 4×8 tent. It works best with an 800-watt light – like the California Lightworks Solar System 550 Grow Light (2 units) or the Mars Hydro Reflector 960W Grow Light (2 units). 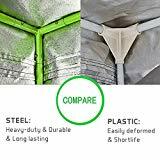 Gorilla grow tents are some of the thickest, tallest, and strongest tents. 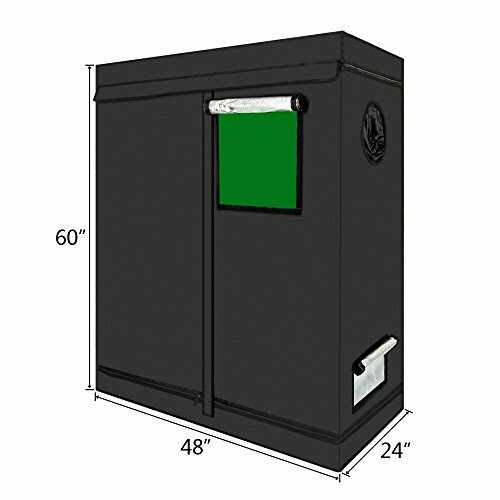 They are ideal for both indoor hydroponics and soil growing environments. 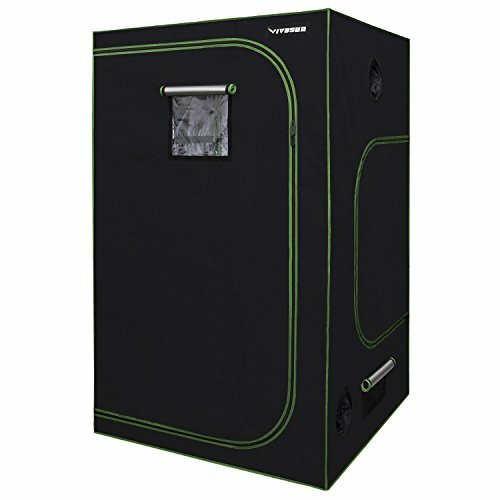 This grow tent is the first of its kind as its height can extend up to 8' or 9'. Unlike the other tents we've reviewed here, it uses 1680D fabric, which is the thickest tent fabric. Its frame is made of metal and is very strong, it can hold up to 300 lbs. 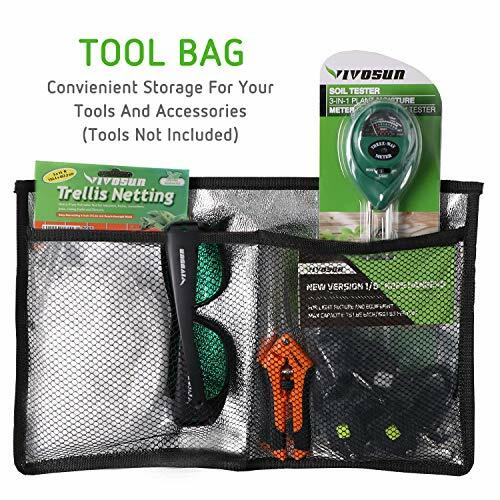 The tent also has a tool pouch for holding accessories. 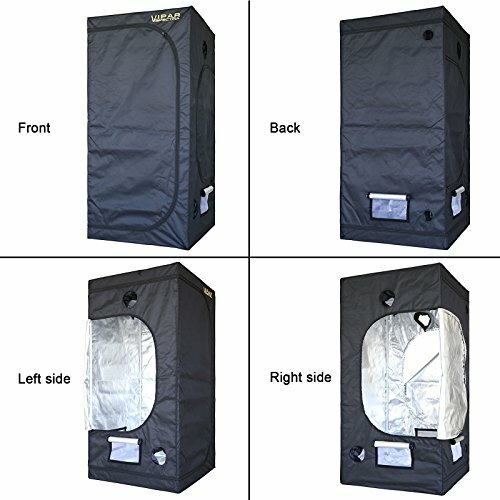 One of the best things about this grow tent is that it is very easy to assemble. 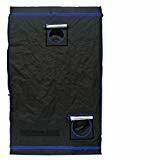 It comes in blue and black colors and is perfect if you want a tent that looks good but is also functional. 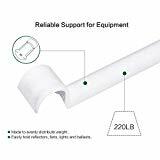 The tent is easy to assemble and has sturdy bars where you can hang heavy equipment and accessories. 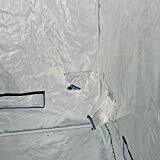 The interior of the tent is lined with 100% reflective mylar that is tear-proof. You'll also love the 2-year warranty the manufacturer gives. With enough space for up to 32 small plants, this light-proof tent is all you need to grow your plants from seedling to harvesting. 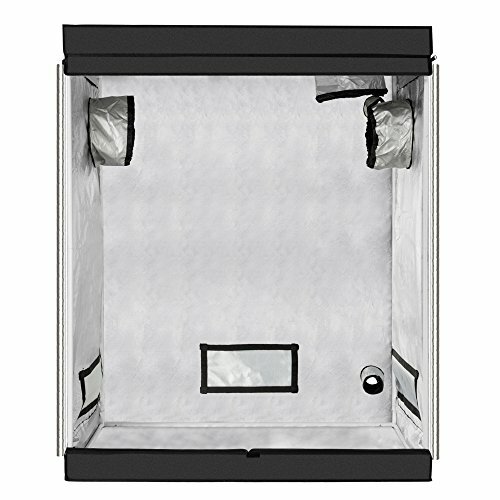 Its reflective mylar interior ensures the light emitted by grow lights is reflected back to your fruits, herbs, vegetables, or flowers. 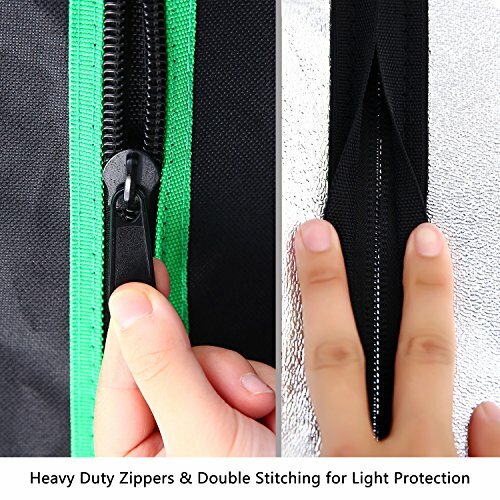 Heavy-duty zippers and double stitching ensure no light is lost. 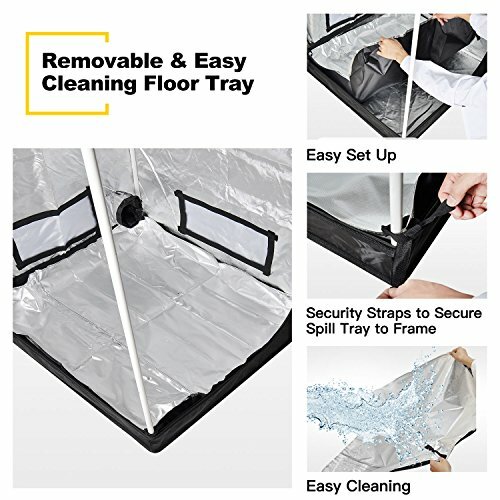 The tent’s interior is resistant to water and a removable floor tray makes for easy cleaning. A user manual is provided so setup is easy. 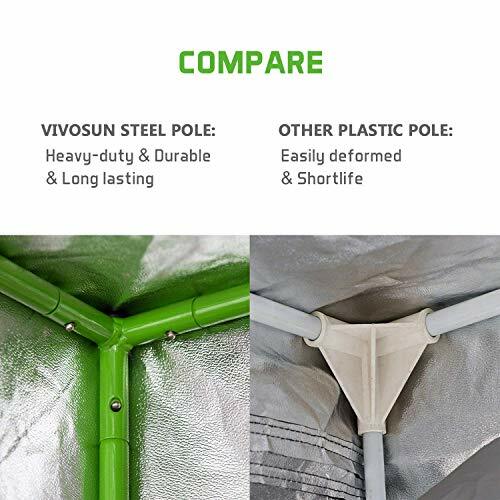 Like all top-notch grow tents, VIVOSUN tents have a reflective Mylar lining on their interiors and extra-thick canvas on their exteriors. 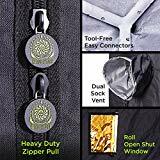 However, one feature makes them stand out, their heavy-duty metal zippers. They don’t get spoilt no matter how often you open or close them. This massive grow tent comes with 2 viewing windows that allow you to easily monitor your plants without opening the doors (and disturbing the environment). Sturdy metal poles support the canvas and are beautifully finished for smooth installation. 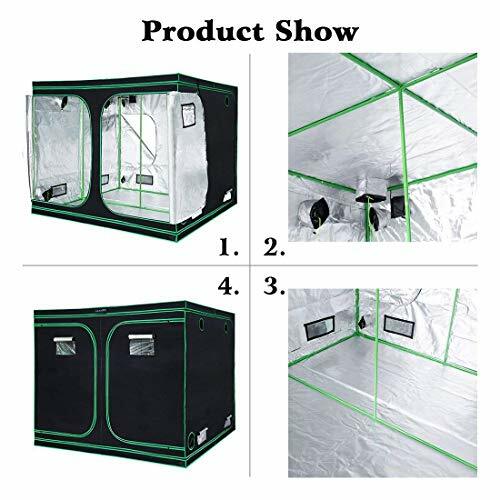 Some of the biggest tents on the market, these are like mini greenhouses. They give plants a good amount of breathing space and can accommodate 38-64 plants. 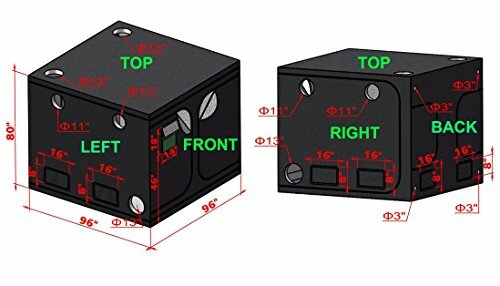 You’ll need 1,600 watts of electricity for 64 plants, so we advise you get the G8LED 900W MEGA LED Grow Light (3 pieces) or the Black Dog Phytomax 2 – 1000 (2 pieces). 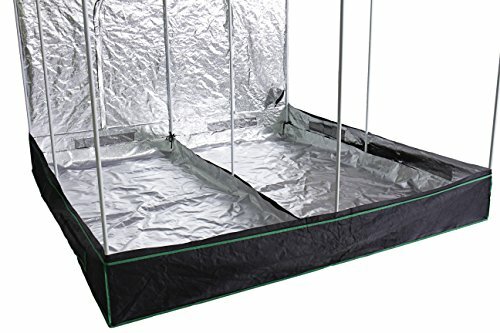 This is a perfect tent for those who want to grow many plants at a go. Like many of the other tents here, its exterior is made of 600D oxford cloth while its interior has a 96% reflective lining that reflects any light emitted back to the plants. Large, heavy-duty zippers and double stitching make sure all of the light stays inside the tent. The rectangular vents with mesh provide enhanced ventilation and the other vents accommodate fans and filters. Hydro Crunch grow tents are specially designed for indoor plants. They are built using durable materials and have metal frames, 300D oxford fabric, and 100% reflective mylar fabric on their interiors. 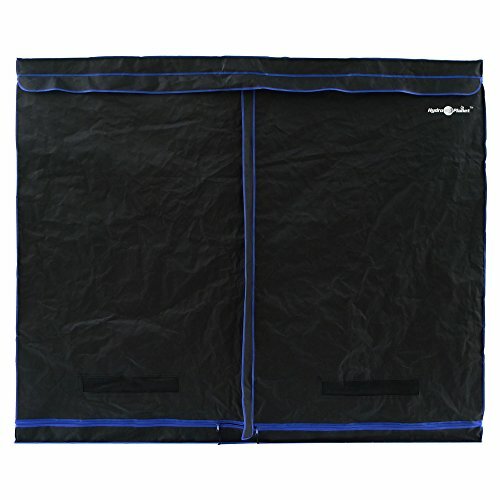 This tent is quite durable and its inner and outer fabrics are fully washable. 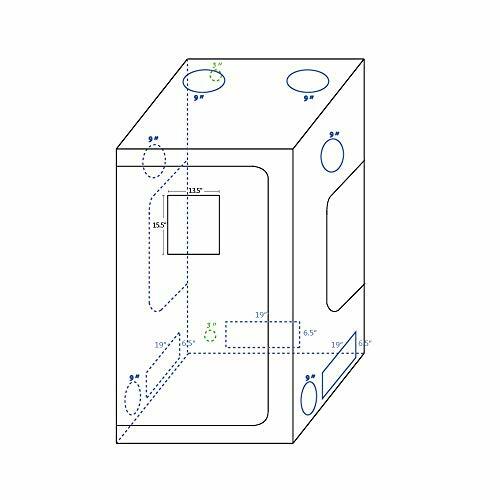 Ventilation windows and cable & air vents are strategically positioned to ensure it is well ventilated at all times. 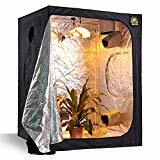 You can grow herbs, vegetables, or exotic fruits in the tent. 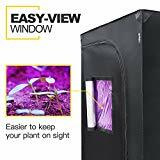 2 viewing windows allow you to observe your plants without disturbing them. 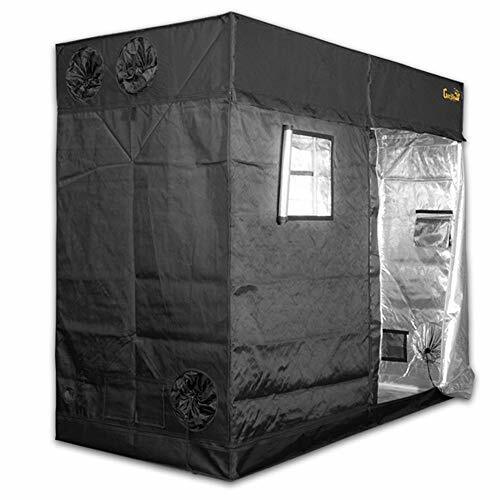 If you want a grow tent that will offer you many years of service, it's this one. 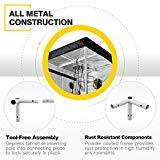 It is excellently constructed and has steel poles and connectors which create a strong frame. 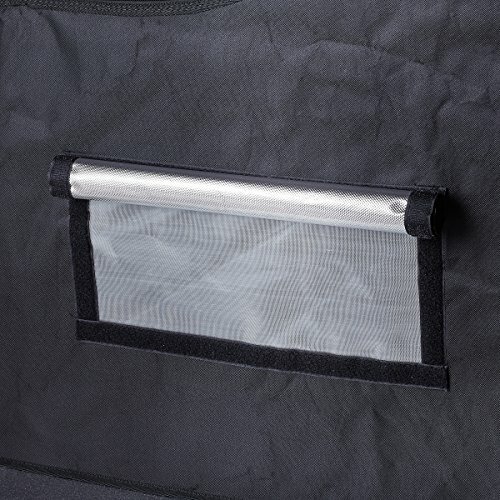 Its heavy-duty zippers have double backing and open and close smoothly. 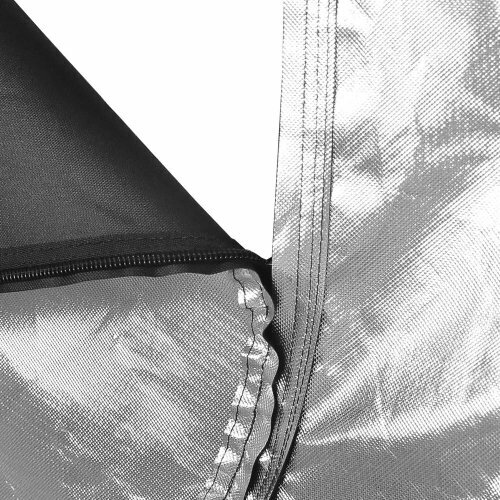 The outer cover is 600D fabric and the interior is lined with diamond reflective mylar (the best there is). 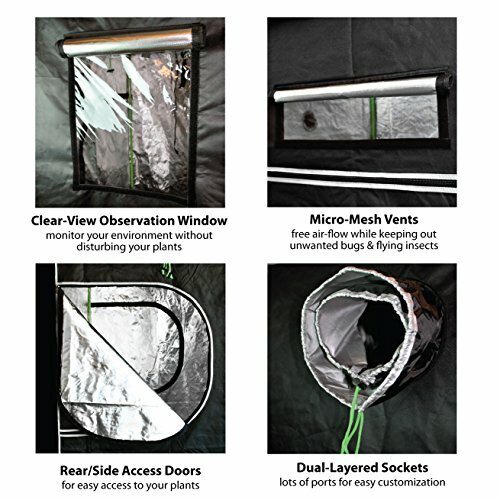 Dual-layer ducts prevent light loss and improve climate and odor control and micro mesh vents keep pests away. 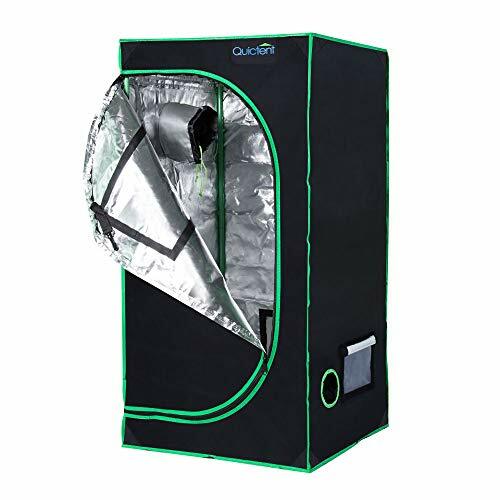 Quictent is a popular tent company that also makes greenhouses and canopies. Its grow tents are eco-friendly and meet high standards for safety and performance. 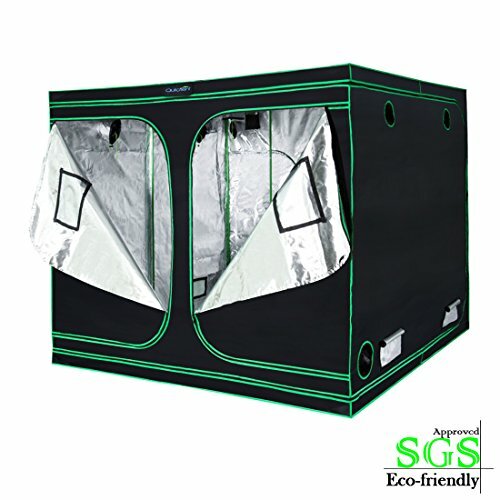 This enormous grow tent has passed SGS testing and certification and is free of toxins. It doesn't emit any harmful substances that may damage your sensitive plants. 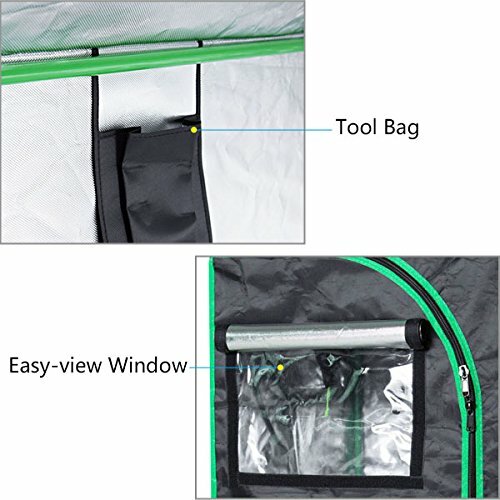 It uses 100% reflective PET mylar lining that effectively returns all the light back to the plants. 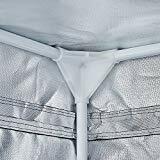 Its net poles are very thick and make the whole tent solid and safe.